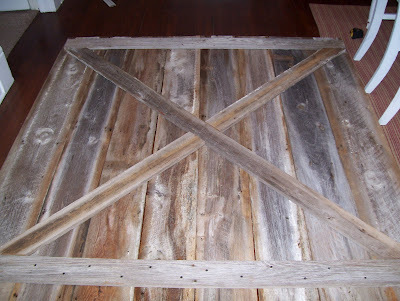 I've been so inspired by barn doors lately and when I found out my hubby had access to lots of old barn wood, I just knew I had to build one. 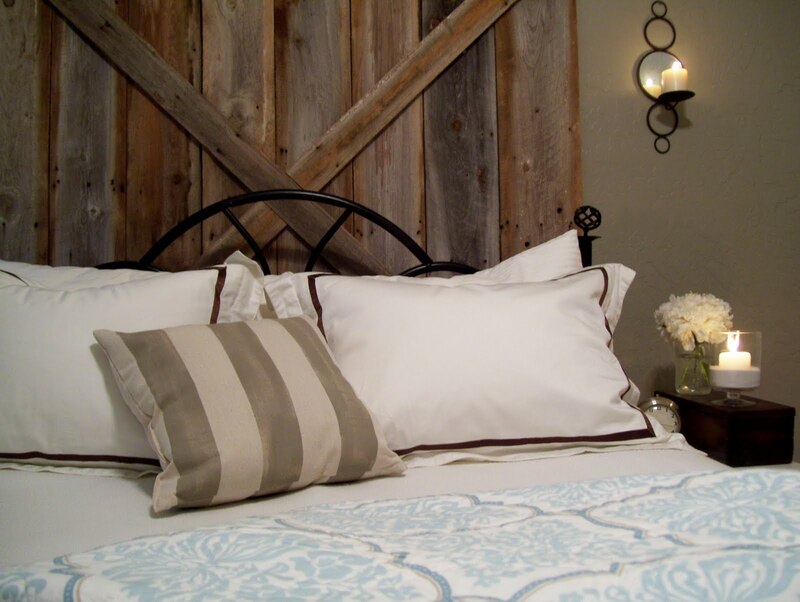 After seeing a bedroom inside a barn (above) in a Pottery Barn catalog, the idea of a barn door headboard was born. It started with this pile of barn wood. I gave it a good scrubbing and left it out to dry in the sun for a day or so. It really is beautiful wood....just needed a little TLC. When I was ready to start putting the barn door together, I loaded up my wood and brought it all inside to my dining room because it was raining. I laid it out to find the most visually appealing look based on the patina of each board. After that, I started measuring for the top, bottom and cross section pieces so I could start making my cuts with the miter saw. The cross section pieces were both 45 degree angle cuts and the rest were straight cuts on the saw. Pretty easy to do and every woman should learn how to use a saw. It's fun! And makes you feel really powerful! After that, I started putting them together with my new nail gun that hubby bought for me. Yay! After being a little intimidated by it, he taught me how to use it and now I don't know what I ever did without one. I don't think I've ever been so excited about how a project turned out before! I LOVE this room. It's romantic, rustic and lovely. Exactly the look I wanted to create. I made the duvet and shams out of a set of white hotel sheets I bought at Sam's and sewed a chocolate brown 1 inch satin ribbon around the perimeter after seeing and loving this duvet set at Pottery Barn but not being so thrilled with the price tag. So I created my own version for a quarter of the price. 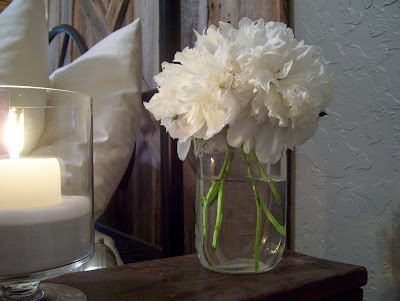 The beautiful white peonies on our bedside table were a gift from my good friend, who also happens to be my neighbor. They came from her peony bushes and they smell so good. A wonderful scent and sight to wake up to in the morning. The candle sconces were a gift from my boys, the fan is vintage, the chippy white bedside table holding the peonies came from the side of the road, no joke. I love the imperfections and chipped paint. Hubby's bedside table is an old sewing machine table that I painted white, distressed, shortened the legs and added an inexpensive drawer pull to. We can't wait to go to sleep tonight in this beautiful setting! Love it! 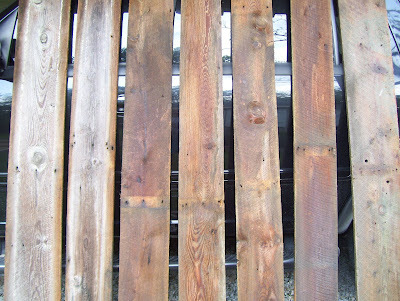 Finding a new purpose for the old weathered barn wood makes me smile.....Have a great week! AWEsome job, Diana! Looks amazing. Love this!!! Also love reading your blog. Brenda told me about your blog and have loved reading it! Don't you love that feeling when a project just turns out perfectly with results you didn't even imagine? I love how it really warmed up and changed the look of the room. 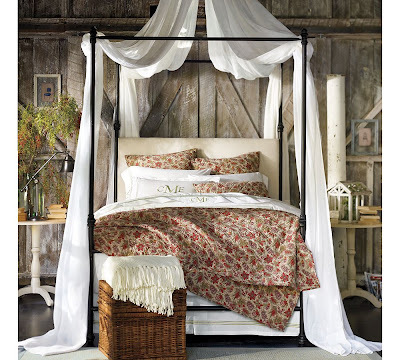 All of your accents and bedding go perfectly. Great job, Diana! It looks fab! You did a great job and have inspired me yet again. 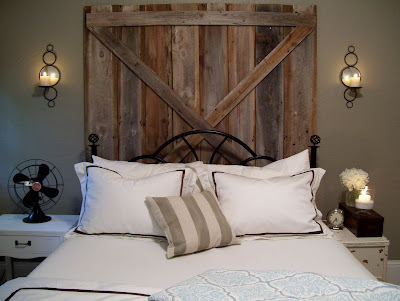 Love, love the barn door! What a great project and I am jealous of your new nail gun! beautiful! love all of it!! i have been looking at the same duvet and shams from PB but i'm not smart enough to have thought of making my own! love that idea! i'm totally going to do it!! thank you!! may i ask where the blue quilt at the end of the bed is from? it's beautiful and exactly the colors i'm looking for! Thanks for sharing how to make the barn door! I agree that powertools make feel powerful myself! Hi Tote, Debby, Sammy and Caleb, the blue quilt came from TJ Maxx! Thanks for your nice comments! Hi! Coming by from the Lettered Cottage referral. I love this idea, it looks fantastic. I am a new blogger to and am happy to be your newest follower! Congratulations on the feature at The Lettered Cottage, that's how I found my way here. 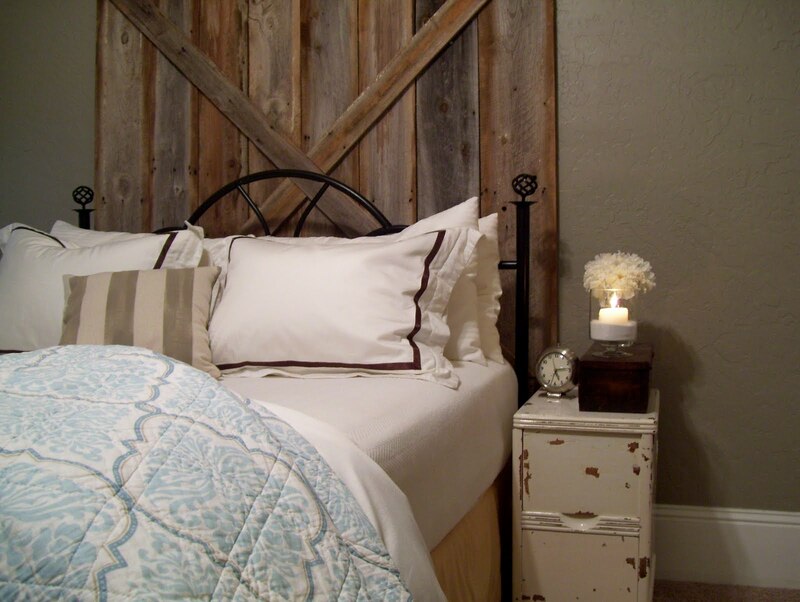 Your bedroom is gorgeous, and the barnboard door a fabulous idea. I like that you kept the metal headboard, it really adds to the look. This is gorgeous, better then PB! I absolutely LOVE the rustic charm! Also loving your blog! Sooo glad I found it - you're a girl after my own heart:) I'll be following! I love how that looks! I'm going for a similar look in our bedroom and I might have to show this to my hubby. I saw this feature on The Lettered Cottage, and I'm so glad I came over! I'd love to make one of these for my own equestrian themed bedroom! I've been staring at my old headboard trying to figure out what I could come up with on a budget and I think this is it! Lovely blog too- your house is beautiful! I heart your bedroom! Makes me want to open the windows and lay in bed and read with a glass of sweet tea! Wow Dianna, I love the barn door thing! That is exactly the look I'm going for in my bedroom. Nice job. I'm your newest follower from Homeroad.net. Stopping by from TLC and love your door! I agree with other commenters, "better than PB!" Great job. Can't was to see what else you'll be cooking up. 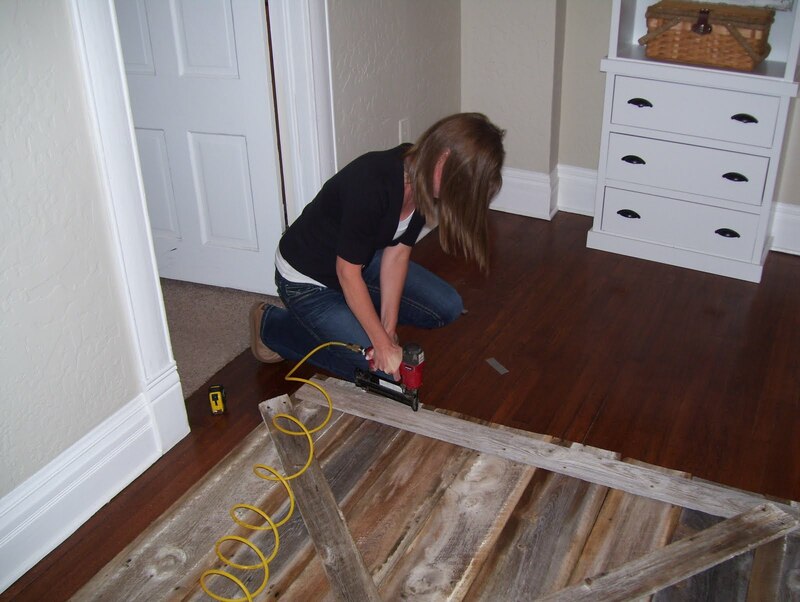 you are BRAVE using that nail gun on the wood floor! lol your master bedroom is beautiful! great job!! 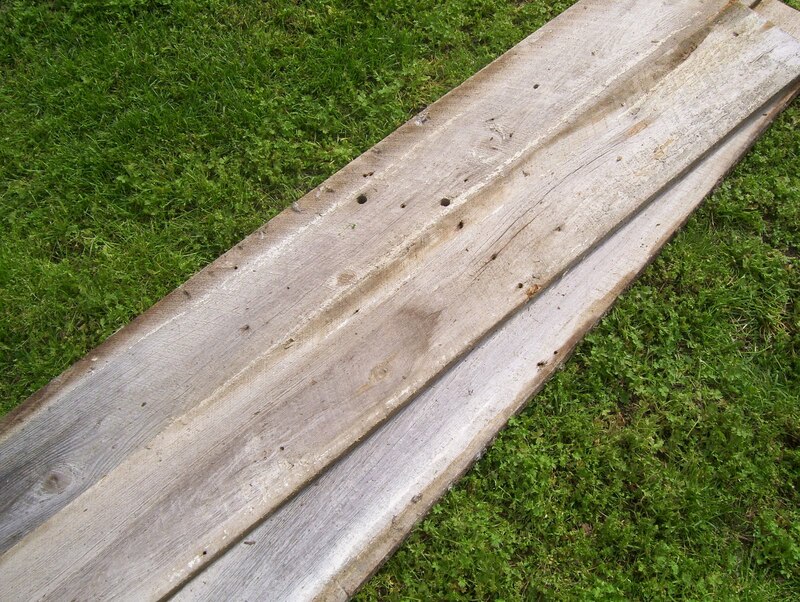 I actually just found an old fence that I'm going to put behind my daughters bed. What did you scrub the wood with, and did you treat it at all? I am just wanting to be sure we aren't inviting any bugs in with it :O). Also, did you just stand it against the wall, or is it attached in any way? This will be her headboard, as she does not have one. I know you have a headboard on your bed. I love your outcome!!! So great! Misti, we scrubbed the wood with a deck brush and regular ol' soap and water. Then power washed all the grime off. I was worried about bugs and spiders, too. We attached ours to the wall, which was difficult and took about 4 of us becuase it is soooo heavy. I would recommend just leaning it against the wall. The only reason we attached ours was because I wanted more height. Good luck! It's beautiful! And I agree with you...using power tools *does* make you feel powerful! Wow - it's fantastic. I think you're going to start a barn board headboard trend! You are a scrappy little thing building that all by yourself! I am impressed and it looks great! 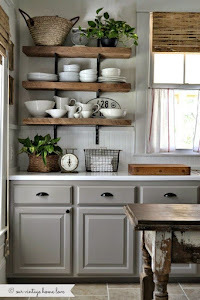 I love the rustic look!! Love the barn door! I found you through Beneath My Heart. I'm a new follower. My husband and I built a barn door to cover up our laundry room opening It looks awesome. They had bi-fold doors up I hate those doors. Like you I love barns. Diana! LOVE the door! Just got the wood from an old barn today to do the same thing, One question for ya, I saw where you'd said you attached it to the wall. How exactly did you attach it? Straight to the wall or did you use pieces of wood to brace it with? I want it to be as tall as my ceiling so I'm wanting the height also! LOVE everything!! Thanks SO much! Beautiful blog - you do such great projects. I just happened upon it and have become your latest follower. I really love the headboard. 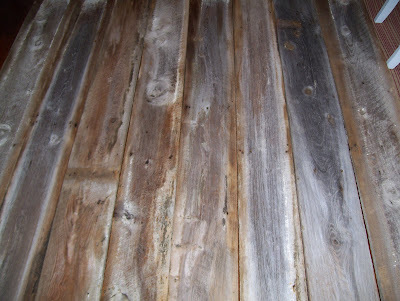 I have some rustic wood in the garage I've been saving for a headboard - it's not barn board, but it would work. You've inspired me to get going on that project! Places to find board? Thanks for you help! Beautiful! I came to your blog through Pinterest, and am so amazed with your home! My husband is building us a farmhouse table, and I was planning to stain the whole table, but now will be doing the legs white thanks to you! Love your blog :). I love the barn wood headboard!!! What is the color of the paint in your bedroom! I just found you via Pinterest. You have such a beautiful, inspirational home. I too would love your measurements on the headboard! It's so gorgeous!! I'll look forward to reading more of your posts. 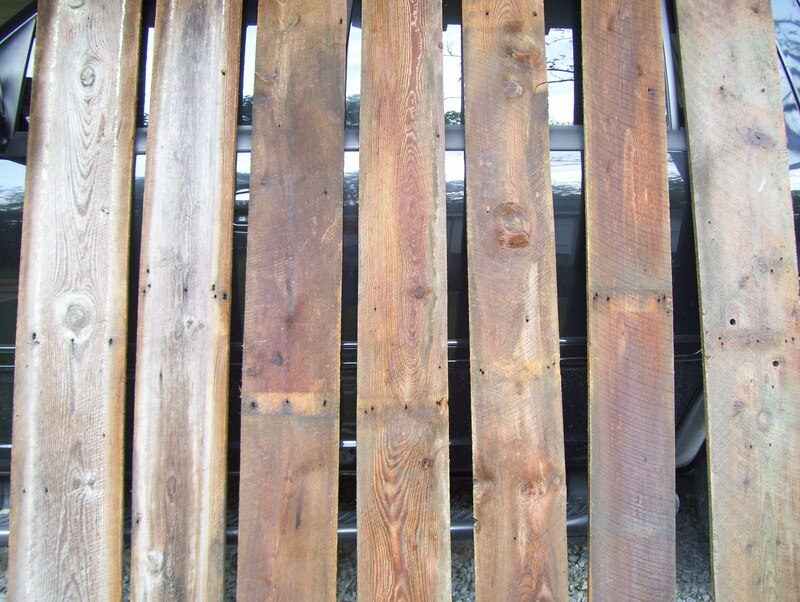 If you are in search of barn board, please check out Reclaimed Designworks. They have two showrooms, Charleston, SC and Denver CO and one coming to Austin Tx. They specialize in providing reclaimed building material such as; flooring, barn board in three different color combinations, mantels and other products. All material is de-nailed, fumigated and kiln dried and shipped nationwide. Check out their website at: www.reclaimeddesignworks.com or visit one of their showrooms. This is truly amazing. Don't tell me you did this all by yourself? If you have, man, hats off. Great job! You really did a wonderful job. I so love the contrast between the barn door and the modern theme of the room. If one really has that determination and interest in something like that of a home builders Missouri project, he/she will absolutely have a taste of success. Thank you for sharing. I recently purchased my first home and am so excited that I found your blog!!! I absolutely love everything you do!! What is the wall color in the bedroom? Wow, I have to say that the modern and vintage theme combination really worked well. I do love your idea because I have this thing for vintage things and your barn door just did added a whole new look to this room. Thank you for sharing this post. I am certain that several homeowners (even those who are thinking of epoxy flooring Louisiana for their home improvement project) will be inspired to also try new things on their own. OMG! I am so glad I found you!!! Your ideas are fantastic and excactly what I am looking for! Excellent work and thank you for sharing ! Beautiful job on this project! I would love to make something like this, but do not have barn wood accessible to me. Can i go to Lowes or Home Depot for regular wood and treat it somehow? Thank you for your help - LOVE your style! hi! i just want to say that your blog has inspired me to do some minor rearranging and redecorating while my husband is at school tonight and i am sitting home alone on a dreary, rainy night. thank you thank you thank you! Great job! You have a wonderful blog. a lot of inspirations... I'm your newest follower! beautiful! I have a thing for barns- Sometimes I think it stems from reading Charlotte's Web as a kid. I'm impressed about your power tool usage. I want a miter saw, but I'm still intimidated by a nail gun. I have been reading your blog for a long time and I must say I love the paint color in your master bedroom. May I ask what it is? My husband and I just bought a new house and we are getting paint color ideas. I'm extremely impressed along with your writing abilities and also with the format on your blog about antique doors Redlands. Is that this a paid theme or did you modify it your self? Anyway keep up the excellent high quality writing, it is rare to see a nice blog like this one nowadays..